The Right Stuff Gone the Wrong Way? With the touchdown of Atlantis – the final mission of the NASA Space Shuttle program – a 30 year era that produced new technologies and valuable space research will come to a close. For the first time ever American astronauts will have no way of leaving Earth other than “hitching a ride” with a Russian Soyuz space capsule at a cost of over $50 million per journey. U.S federal budget cuts have made the shuttle program’s operational costs unsustainable even though NASA constitutes less than half of 1 percent of the federal budget. In the future, private companies will build and service rockets and spacecraft, effectively turning the space agency into a customer. Among others former astronauts Neil Armstrong, John Glenn and Jim Lovell have protested to no avail. The Constellation program to revisit the moon has also been canned. It would seem the almighty bottom line has become so sancrosanct that even treasured national programs are not safe from privateers and government spending cuts, especially in the current climate of national debt. Here’s an interesting thought: can there be the same sense of national pride in U.S space achievements when operations are partly controlled by commercial companies with an eye for profit? The NASA space program will go on of course with it’s International Space Station obligations and the eventual design and building of new propulsion systems and spacecraft, but the fact that a great symbol of American pride can effectively be grounded, in my opinion, brings a question into play. 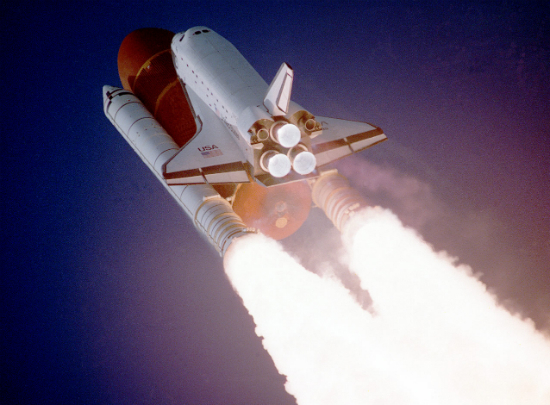 I wonder whether the downgrading of NASA is symptomatic of a larger malaise affecting the United States – namely a loss of confidence that has the country turning inward? Has the decline in U.S power and prestige bruised the grand adventurous spirit the nation is renowned for? Not being from the U.S I cannot have the same sense of loss that some Americans may have over this issue, but then I clearly recall the awe I felt watching the moon landing as a 12 year old in my high school gym, so perhaps I can empathise. The United States more than most nations is a master of improvisation; of renewal; of the ability to reinvent and reinvigorate itself in times of difficulty. It must have a sense of destiny. It must have a cause in order to grow men and women with the “right stuff” . That cause is the Columbus of the 21st century – space exploration. The NASA space program is wedded to U.S national pride. It needs the whole country at the reception. I must sadly agree. America is letting the wrong things take the lead, due to much political manhandling (blatent abuse of the ‘little people’), the browbeating and misinformation supplied (in excess) by both sides of the warring political factions. Who do their very best and invest millions upon millions of dollars (of the little guys money), convincing their members AND the general voting public….that the ‘Other Guys’ are taking food off their tables and out of the mouths of their very own babes…that paper and pencils can no longer be had by their school age children, nor books, sports or arts programs any more in our GREAT land because of NASA, (otherwise now known as ‘nada’)….. ‘Those Other Guys’…and the nasty~wasty president, social security, mandatory health insurance or..the evil weevil opposition, the speaker of the house, tea party cronies, and more tax breaks for the rich and….oh, the NRA, the PTA, STP, birds and bees and KFC…. Its all just a bunch of well doctored ‘spin’…Upon spin, upon spin…(dizzy yet? )They are ALL (to no avail), desperately trying to hide, fix or exaggerate all the ‘Other Guys’ political slips, gaffs and screw~ups over the last 120 years…Because ‘Someone has got to ‘PAY’! Hey, Lets beat those spin doctors at their own game. Lets pre-bend, dent and depress those minds, right from the ‘get~go’…Heres a shot!…. *Cue comforting, ‘Disney’ style, warm voice and playful, simple, color animation* enter fatherly rooster wearing a cowboy hat…. and now, lets all sing along”…. where seldom is heard an encouraging word..
America does need a wake~up call…We dont do it for US…We do it for ALL..There is no cant….WE can and WE WILL……We just have to start all over again, from right HERE and from right NOW. Excellent comment, Lisa! If it’s any comfort you aren’t alone when it comes to politicians playing the public for fools. It’s a sport in Oz. I also feel there is something else happening: the cult of the individual; the selfishness of a consumer society that wants it all at the expense of what is best for all of us. Everyone wants it on a plate and politicians play this vibe like a violin. There’s too much “me” and not enough “us” these days. So you have the double whammies of poor political decision making and vote buying, and a public whose vision has narrowed and tuned inward on itself. IMO, It’s the big initiatives, the grand ideas and schemes that make a people great. So much petty self indulgence across the board and too little pitching together to get things done and move forward. NASA is one of those great initiatives. It’s ironic, isn’t it? Russia is half the size of the U.S and nowhere near as wealthy and yet they are still launching into space. IMO a main reason for the closing of NASA by Pres. Obama is that he (Obama) hates Texas. Pres Obama has closed down drilling, his EPA has been after us since he got into office, we’ve had wildfires burning across the state since December 2010, Obama has repeatedly refused to grant Texas relief (he authorized help for on fire in April). Another thing is Pres. Obama has been apologizing for the help we’ve given other countries (WWII & on). Why? What’s he ashamed of? He doesn’t want the USA to succeed. He’s trying to make the USA into a 3rd world country. The people of the USA stil have pride in what we’ve done and what we will do. Remember this is all just my little ole opinion. Thanks for your comment, Linda. I’m no expert on the domestic politics of the U.S but I find it hard to believe the President of the United States would set out to victimize Texas for no apparent reason. As I understand it Texas was a substantial win for McCain during the 2008 Presidential Election so maybe Obama feels Texas is a lost cause electorally, but I doubt he hates the state. Don’t forget, NASA was already under budgetary cuts during the Bush Administration. You are entitled to your opinion, and I respect you for voicing it, but I can’t believe Obama wants to turn the U.S into a third world country, as I see it he’s actually trying to save it from going down the gurgler because of your national debt, no thx to the Republicans who are trying to thwart him every step of the way. I have to say were you living here and experiencing what I experience your opinion would probably change. The only reason McCain won Texas is that by the time Texas got to vote in the primaries, Texas was left with no one to vote for except McCain or Obama. In the general elections I voted down ticket, but for neither of the presidential candidates. I don’t believe McCain would have been any better than Pres. Obama. As for pride in our country, maybe it’s a Texan or southwest attitude, we have no shortage of pride. We are adventurers, explorers, risk takers. No matter where we go in the world people know Texas. When necessity is the mother of invention, we fear inspiration is an orphan. NASA was conceived in the Space Race, from fear of Communist Mother Russia and competition to claim ownership of the new frontier. The gleaming white rockets, billowing trails in the clouds like the white steed of a hero’s horse racing off for adventure. I love NASA, having grown up watching the shuttle launches in my front yard, I was there for the first and last launch. I am sentimental over seeing the era of greatness end, but, I can’t believe it is the end of our adventures. I do not believe we have lost our confidence. I believe we lost our inspiration; our motives have changed. When we stopped fearing annihilation and started working with our global community to reach similar goals the need for excess was eliminated. As we embrace the unity of global cooperation in space exploration, it is more efficient to spend 50 million to hitch a ride with Russia to the space station. I’m not trying to support the idea that it was capitalism that killed NASA, but that it was efficiency of intellectual inspiration which put the horse out to pasture. It makes more sense to work together than to keep secrets from each other in this area of progress. The same is true in the search for medical cures. When research, funding, and result is not shared globally, it slows the progress for success. I believe any space exploration should be a global entity, similar to the concept of NATO, but perhaps exclusively run by scientists. I think something like this for all fields of science would further our global progress. Utopian, I know. I am often accused of such naivety. However, I still surmise the loss of NASA is not a symptom of national insecurity. NASA, as a John Wayne archetype, is experiencing what any realist will attest to, at the end of the day, the hero beds his horse, hangs his hat, and retires with a heart full of accomplishment. I like your optimism, Melissa! I hope you are right re U.S confidence and ambition. I sense the country is less united behind common causes and becoming more preoccupied lesser aspirations – as I said in my post, a turning inward. Consumerism and bickering over universal healthcare, politicians feeding off anxiety over immigration and so on. It’s just my impression of course, I don’t live there. I agree wholeheartedly that space exploration should be an international effort – sharing the costs etc. Still, a strong NASA is an expression of a confident, outward looking America. The symbolism alone is important.